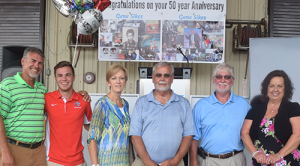 The Sikes family, from left: Kevin (son), Denton (grandson), Cookie (wife), Gene, Roger (brother), Helen (sister-in-law). 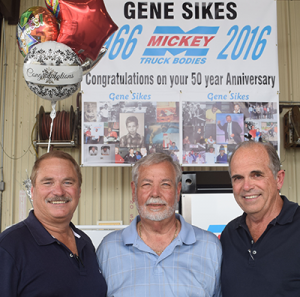 On August 24, 1966, Gene Sikes reported to Mickey Truck Bodies for his first day of work at the High Point, NC truck body and trailer manufacturer. Exactly 50 years to the day, on August 24, 2016, his family, his Mickey colleagues past and present, and Mickey executives gathered to celebrate his half-century anniversary with the company, the longest tenure of any Mickey employee since the late Carl Mickey, Sr., the founder’s son. 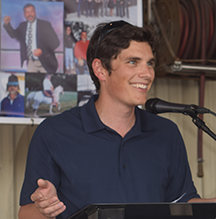 In between those 50 years, Gene held a wide variety of jobs and eventually worked his way up to VP of Manufacturing, a position he held throughout the company’s critical transformative years in becoming a world class manufacturer and market leader in all of its customer industries. Gene Sikes flanked by Carl Mickey (left) and Dean Sink.